Boat Builders are not required to install navigation lights. Navigation lights are normally the boat owner/operator's responsibility. However, most boat builders install lights because that is what their customers want. If you do install navigation lights, the Coast Guard will require you to install them correctly. They may even require you to recall boats that do not have correctly installed navigation lights. Also, if you do install navigation lights then you must put a certification label on the boat. Clarification: The navigation rules on postioning of lights apply to anyone who installs lights whether it be the builder or the owner/operator. The rule require they be installed correctly. The rules for certification of lights apply only to manufacturers, dealers and distibutors. A few years ago the Coast Guard changed the rules on navigation lights. 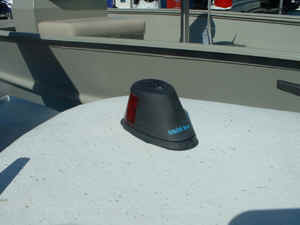 Prior to the current rule, navigation lights on recreational boats had to meet the requirements of the Navigation Rules but did not have to be certified by the light manufacturer. Now they must be certified and labeled as meeting the requirements of ABYC Standard A-16 or an equivalent standard. Most will simply have a label that says USCG 1nm or USCG 2nm, meaning they meet the rules and are visible at 1 nautical mile or 2 nautical miles. The entire labeling requirement is found in Title 33 Code of Federal Regulations Subopart 183.810. Visibility of the light in nautical miles. Identification and specification of the bulb used in compliance testing. However, on very small boats less than 7 meters in length (22 ft) that go no faster than 7 knots, the lights can be any all round white light. On sailing or rowing dinghies on inland waters any light is all that is required. Even a flashlight is within the rules. These do not have to be certified. Obviously that label is too large to fit on most navigation lights so the rule allows the label to be on the package the light comes in, and a shortened label is put on the light. What this mean for you is that when you buy, ask about the certification. Ask if the lights are labeled properly. When you get the lights check them to see if they are labeled. Put the correct certification label on the boat to indicate that you certify that the light meet the rules. The most common violation concerning navigation lights is improper mounting of the lights. Follow the manufacturers instructions to the letter. Makes sure the the lights are properly aligned with the centerline of the boat. Do not mount light below the sheer line of the boat. Lights mounted below the sheer line cannot meet the vertical sector requirements. See note below. The sidelights of a power-driven vessel shall be placed at a height above the hull not greater than three quarters of that of the forward masthead light. They shall not be so low as to be interfered with by deck lights. This means you cannot have the sidelights below the sheer line of the hull on a boat configured for international OR inland rules. I repeat, on boats configured for inland rules you cannot use bullseye type lights below the sheer line. Lights must not be obstructed by structure of the boat or by other things on the boat. All around white lights must be visible 360 degrees around the boat. Also there must be a one meter vertical separation between the side lights and masthead or all around white lights. That means the all around white light must be 1 meter (39.3 inches) higher than the sides lights. Also, make sure the red and green are on the correct sides. red - left (port) and green - right (starboard). This sounds simple but I have seen it at boat shows. Several years ago, at a major boat show, I found over ninety violations of navigation light regulations. It is too easy to do it wrong.